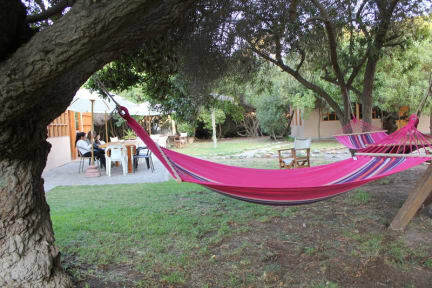 Hostal El Arbol II - Beach i La Serena, Chile : Boka nu! 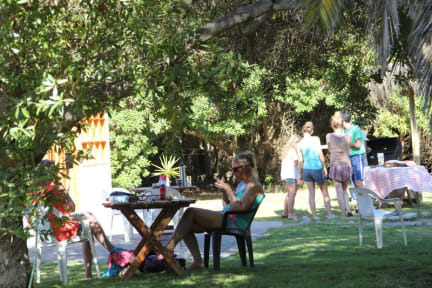 Hostal El Arbol II - Beach is located at approx 500 meters from the bus station, 1 km from the historic city center and 600 meters from the beach. From there you can walk to visit the historic downtown , with its many and ancient churches from colonial times, the archaeological museum, the lively city streets with handicraft market, restaurants and pubs, etc. and also walk to the beach. There is a big supermarket nearby,where the guests can buy a variety of food to cook at our well equipped and large kitchen. Also the bus stop to take a bus to the nearby city of Coquimbo, is only one block away from us. We have different type of rooms : Private matrimonial and double twin rooms, and 4, 5,6 and 8 bed dorms, with new and very clean , shared bathrooms. There is a big communal kitchen for use of the guests, a living room with a cozy fireplace, sunny terraces outside and a very large garden with flowers, green lawn to rest, umbrella tables, and hammocks. Free Coffee in the morning.